Last week, Hews Media Group-Community News exclusively reported that Cerritos College had executed a five-year rental agreement with Norm Reeves Honda Cerritos that would pay the district $35,500 per month, $426,000 annually, for use of the Manassero strawberry fields located at 166th and Studebaker. Construction began last week and residents were irate; Cerritos City officials indicated they were unaware of the construction at the time. Community Development Director Torrey Contreras told HMG-CN that the construction began without the city manager’s knowledge or consent. Contreras and City Manager Art Gallucci only found out after being notified by residents and then went to inspect the site. “We did not know anything about it, ” Contreras said. The City immediately issued a stop work notice after learning that Cerritos College was creating parking for faculty and students and for the storage of automobiles for the Cerritos Auto Square. Sensing pushback, the College scheduled a town-hall type meeting on Aug. 23 to answer residents concerns. It was during the meeting that a bombshell was dropped by College President Dr. Jose Fierro. Cerritos had sent personnel to watch the presentation and officials were not pleased after with Fierro’s presentation. When asked for comment, HMG-CN was sent a long response from the College outlining the meeting from Miya Walker, Director, College Relations, Public Affairs & Governmental Relations. Email from Miya Walker, Director, College Relations, Public Affairs & Governmental Relations. Click on image to view larger document. The letter described the May 9 meeting; present was Gallucci, Contreras, Felipe Lopez, and Dr. Jose Fierro. 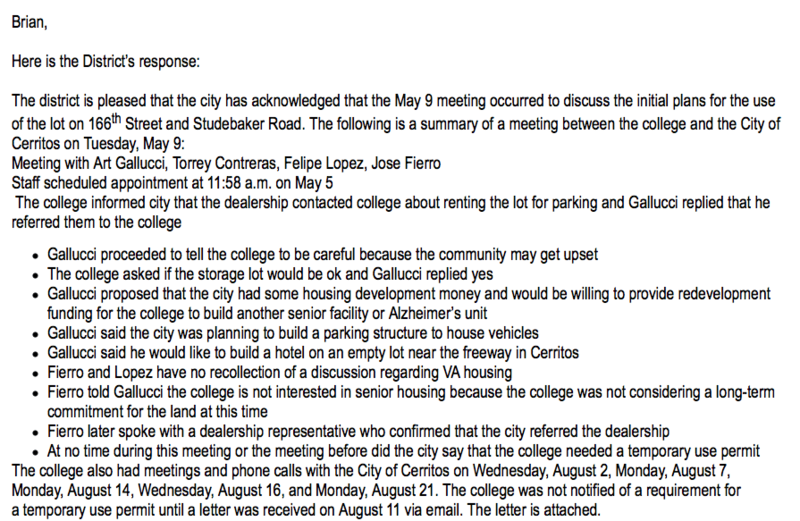 The letter stated that they told Gallucci it would be a “storage lot” and if that would be ok; Gallucci responded yes according to the College. The letter then outlined several proposals from the City other than the car lot for consideration. Fierro then indicated he spoke with a dealership representative who confirmed that the city referred the dealership. The information about Fierro’s presentation was relayed to Cerritos officials, who issued a scathing statement blasting Fierro. First page of letter from City of Cerritos to Cerritos College, click on image to view entire letter. The City proceeded to refute much of Fierro’s statements in the presentation. The College hand-delivered a flyer to residents in the vicinity of the campus to invite them to the community forum stating that the College was working with the City of Cerritos to finalize an agreement with Norm Reeves. Another point of contention was the fact that Dr. Fierro stated that the City issued a stop work notice on August 1, 2017, which was removed on August 2 based on the outcome of a meeting between College representatives and City staff. The City once again denied that statement from Fierro. The agreement paid the College $35,500 per month, $426,000 annually. The two entities then arranged a meeting on Aug. 2. August 10 letter from Cerritos College to the City of Cerritos, click on image to view entire letter. This was in reference to the non-educational use of the lot, under Government Code, the City has jurisdiction and must approve any project that is non-educational in nature. The College told the City that they were using the lot for student parking, thereby exempting the lot from City approval. Lastly, the City disputed Fierro’s statement that the City had approved parts of the project. A letter dated August 11, 2017 from Gallucci to Fierro supports that statement. Letter from City of Cerritos to Cerritos College commenting on the preliminary plans submitted by Cerritos College. 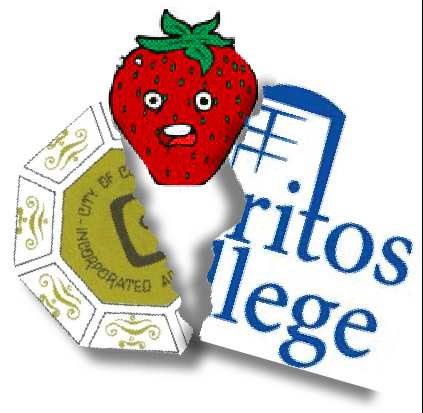 Cerritos College submitted an application for a TUP on August 15. City Council consideration of the proposed TUP is scheduled for the City Council meeting of September 18. The City is expecting a packed Council chamber that night. Wait wait wait. As a resident, I can’t let my kids pretend to dig with their toys in my backyard under the cover of darkness without City construction premits filled in triplicate with some lackey at City Hall and the College thought this whole project could move forward on a wink and a nod given over catered tacos and virgin margaritas? Either there are stamped and signed plans on file, which they have a copy of, and the city is full of crap, or there aren’t, and the college is full of crap.